Doctoral research on radium by Marie Curie. 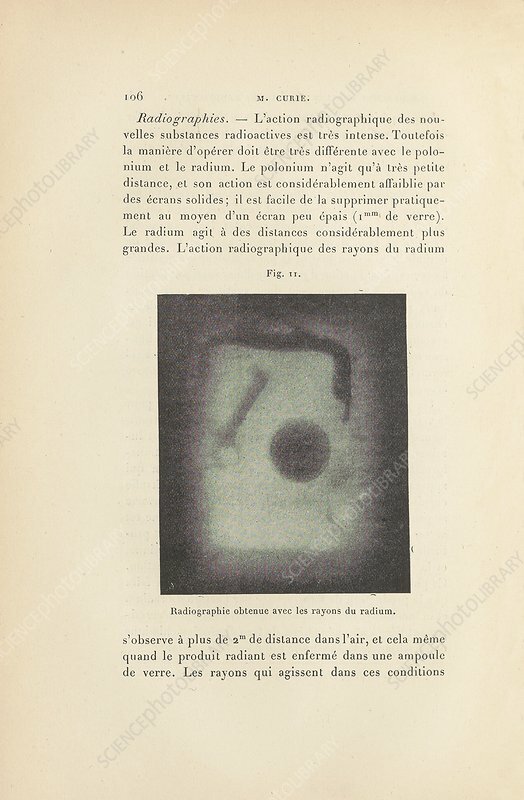 This page is from the 1904 PhD thesis of Polish-French physicist Marie Curie (1867-1934, nee Marya Sklodowska). It shows an X-ray (radiograph) produced by radiation produced by a sample of radium. Curie's thesis was titled 'Recherches sur les substances radioactives' (Research on Radioactive Substances). Born in Poland, Curie had became a student in France in 1891. She and her husband Pierre isolated the radioactive elements polonium and radium in 1898. Marie and Pierre won shares of the 1903 Nobel Prize for Physics for their work on radioactivity. Marie won the 1911 Nobel Prize for Chemistry for the discovery of polonium and radium.